Compressed air enters the vortex tube powered Cabinet Cooler and is converted into two streams, one hot and one cold. 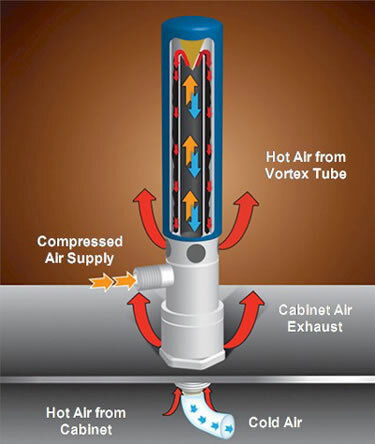 Hot air from the vortex tube is muffled and exhausted through the vortex tube exhaust. The cold air is discharged into the control cabinet through the cold air distribution kit. The displaced hot air in the cabinet rises and exhausts to atmosphere through the cabinet air exhaust at a slight positive pressure. Thus, the control cabinet is both cooled and purged with cool, clean air. Outside air is never allowed to enter the control panel.